T﻿rinity Memorial Episcopal Church (TMC) has served as a house of worship and community resource for more than 125 years. A progressive congregation welcomes all who seek a place of spiritual growth to serve God and the community. Feasts and festivals are joyful celebrations of abundant blessings. Scripture and every-day intersect, weaving lessons of the Gospel into explorations of how to lead spiritually centered lives in our increasingly complex world. 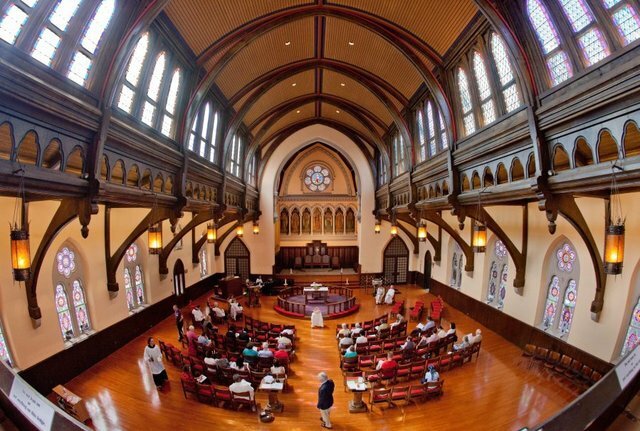 Housed in a unique architectural structure, TMC’s beautiful sanctuary was redesigned after a fire in 1994 to reflect the cooperative needs of real people working together to make community in a vibrant neighborhood. Open and airy, with a circular communion rail surrounding the altar Table and a flexible seating design, the superb acoustics enhance every musical note in worship, from soft voices to soaring vocals of children and adults in choir.